On June 11, 2013, a delegation of the Russian Orthodox Church including Metropolitan Feodosy of Tambov and Rasskazovo and Rev. Mikhail Asmus of the Moscow Patriarchate’s department for external church relations arrived in Istanbul to take part in the celebrations held by the Patriarchate of Constantinople on the occasion of the name day of His Holiness Patriarch Bartholomew of Constantinople. They attended the Matins celebrated at the Patriarchate Cathedral of St. George on Fanar with Polyeleos devoted to Ss Bartholomew and Barnabas and the Divine Liturgy that followed. A part of St. Bartholomew’s relics was put out for veneration. Praying together with Patriarch Bartholomew were hierarchs of the Patriarchate of Constantinople and representatives of the Churches of Jerusalem, Russia, Serbia and Greece. There were also Greek governmental high officials, patrons of the Church of Constantinople, faculty and students of the Patriarchate of Constantinople’s Center of Post-Graduate Education in Chambesy, Switzerland, and monks from the Russian Monastery of St. Panteleimon on Mount Athos who serve at the monastery’s representation church in Istanbul. 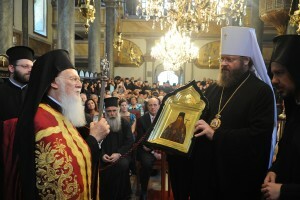 After the service, Metropolitan Constantine of Nicea, the oldest consecrated hierarch, addressed his Primate on behalf of the hierarchy of the Church of Constantinople. Then Metropolitan Feodosy read out a congratulatory message from His Holiness Patriarch Kirill of Moscow and All Russia. 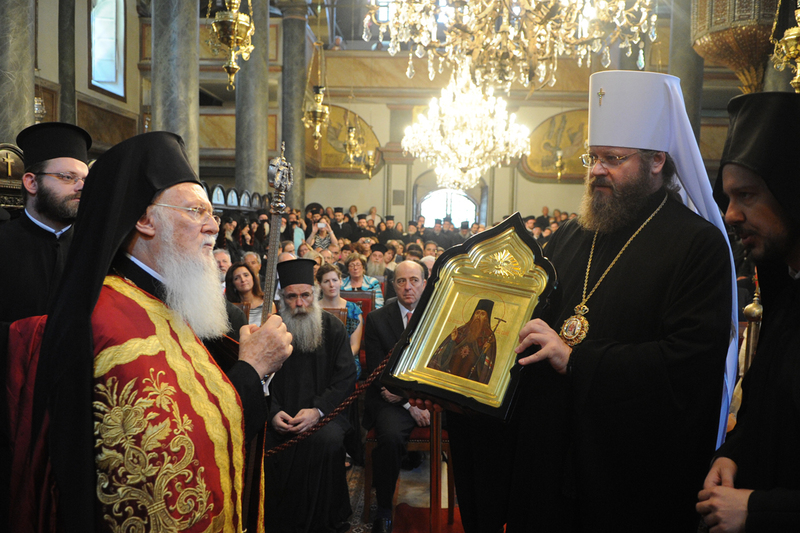 He conveyed to His Holiness a gift – an Icon of St. Pitirim of Tambov, whose centenary will be marked in 2014. Presenting the icon, His Eminence noted that the names of many Russian saints venerated throughout the Orthodox world were associated with the Tambov land. Patriarch Bartholomew asked him to convey gratitude to Patriarch Kirill for having sent a delegation of the Moscow Patriarchate, for the congratulations and prayerful memory. After a grand reception given by Patriarch Bartholomew, Metropolitan Feodosy and Father Mikhail Asmus visited the Chora Monastery famous for its frescoes and mosaics.